Sanjay Ranka, Ph.D., professor, and Daisy Zhe Wang, Ph.D., assistant professor, have been named affiliate faculty members of the College of Medicine’s Institute for Child Health Policy. The institute focuses on disparities in health and health care outcomes for minority and underserved children and develops strategies and interventions to address these issues. Dr. Jih-Kwon Peir’s paper entitled “Bloom Filtering Cache Misses for Accurate Data Speculation and Prefetching” co-authored with S. Lai, S. Lu, J. Stark, and K. Lai has been included in the “25 years of International Conference on Supercomputing”. The selection committee reviewed the top 100 most-cited papers out of 1800 papers published in ICS proceedings between 1987 and 2011 and selected 35 papers to be included. Junjie Li’s paper wins the best paper award at the 6th International Conference on Bioinformatics and Computational Biology (BICoB) in Las Vegas. “Optimal Alignment of Three Sequences on a GPU” is co-authored by CISE faculty Dr. Sanjay Ranka and Dr. Sartaj Sahni. The CISE department’s student-run organization WiCSE (Women in Computer Science and Engineering) led an outreach day on March 25, 2014, for middle school girls. The girls were attending a week-long spring break camp hosted by the UF WISE group, sponsored by the Florida Museum of Natural History, spending one day in each of 5 science and engineering departments around campus. Friday, March 28th 2014 from 4:00PM to 5:00PM in CSE Building room 404 Dr. Srikant will be presenting on Resource Allocation and Networking in Clouds and Data Centers. For the full announcement flyer, please click here. Last November, sparse matrices came together with electronic music to appear on billboards around London for the LEAF 2013 Electronic Music Festival. Dr. Vipin Kumar will be presenting: “Understanding Climate Change: Opportunities and Challenges for Data Driven Research” Friday, March 21, 2014 from 4:00PM to 5:00PM in CSE Building room 404. The Department of Computer and Information Science and Engineering (CISE) is searching to fill one senior position at the level of associate or full professor in the area of personalized learning under UF’s Rising to National Preeminence program. A team consisting of students affiliated with the UF CISE Data Science Research Center and Warrington College of Business Administration finished in second place in the 7-hour Hoggetowne Hack 2014. Prof. Chandrajit Bajaj will be delivering the first lecture in the Barr Systems distinguished lecture series for 2013-14. The seminar will be held on Tuesday, October 15th from 4-5PM in CSE E121. Sartaj Sahni was recently named the Editor-in-Chief of the Association of Computing Machinery (ACM) journal Computing Surveys. The ACM is the premier professional association for computer science. Computing Surveys has the highest impact of all the ACM journals. The journal publishes surveys, tutorials, and special reports on all areas of computing research. award since it was established in 2003. All graduate students working in hyperspectral image analysis are expected to attend. Also, if you are a PhD student, this seminar will count towards your PhD requirements. A PDF of the seminar announcement can be viewed here. The Association of Graduate Students in Computer and Information Science and Engineering (ASCIE) is hosting Computer Science Day in conjunction with the annual Artificial Intelligence in Computer Games Day at the University of Florida. Computer Science Day is intended to promote awareness of the importance and impact of Computer Science and to showcase just how much fun it is! The event will be on Monday, April 22nd 2013 from 12:00PM to 5:00PM at the CSE Building next to Turlington Plaza and Marston Science Library. Society for Industrial and Applied Mathematics (SIAM) on March 29.
about 34 have been elected each year since then. For contributions to sparse matrix algorithms and software, including the University of Florida Sparse Matrix Collection. During the May 29, 2012 “Open Faculty Forum about Budget Cut” called by the central administration, President Machen and Provost Glover were asked, among others, several questions from this list, based on an independent report on UF’s reserves, including those held by the University “proper” and those held by the University’s various “discrete component units” including Shands; including approximately half a billion dollars categorized as “restricted expendable;” and over 100 million dollars held by the University “proper,” and characterized as “unrestricted net assets.” Candid answers were not forthcoming. In a message to you a couple of weeks ago I listed a number of questions to which I suggested members of the university community – faculty, staff, students – deserved an answer. The current Acting Chair, Gerhard Ritter, is due to step down on June 30. On Wednesday June 6, 2012, Provost Joe Glover and Dean Cammy Abernathy announced that Dr. Paul Gader will be CISE’s new Interim Chair. A process for selecting a permanent chairman for CISE was also discussed. See previous posts on the topic below. “They can and will do anything to your professional life.” “No matter how irrational their decisions, watch out what you say: they don’t like it if you question their decisions, and they have ways of using the tiniest pretext to professionally harass you.” “If your department speaks out collectively, then they will retaliate and harass your department.” Statements such as this have become increasingly common among College of Engineering faculty as the tenure of the current Dean progresses. In the current limbo when the departments in the College prepare their 2.7% across the board cut (announced as the 3rd and hopefully final of Dean Abernathy’s proposals for the 2012 budget cut), this atmosphere of fear of retribution and retaliation is palpable. What does this say about academic freedom within the College of Engineering? The following emails were “sunshined” as part of a public records request. The University of Florida’s annual report as well as an independent audit reveal the financial health of the university. Conservatively, the University of Florida is sitting on a mountain of cash classified in many different yet equally accessible ways. It doesn’t matter whether we discuss the $1.015 billion total, the $111 million in “unrestricted net assets,” or the $540 million classified as “restricted expendable.” President Machen and Provost Joe Glover have decided to make permanent cuts to the university’s structure when cutting a check would suffice. Several faculty, students, and staff have joined a university-wide coalition outraged at the disconnect between state lawmakers and university administrators. The SaveUF! Spend the Reserves campaign is actively protesting this unnecessary austerity. On May 14, President Machen admited that spending the reserves may be a viable delay strategy but is an ill-advised longterm strategy. We disagree. We disagree because the Board of Governors as well as state lawmakers have repeatedly affirmed that the budget shortfall will be returned to baseline next year. On May 23, the SaveUF! Spend the Reserves coalition led a teach-in where its members gave short speeches to the public, educating them about the budget cuts and the administration’s strategy. WUFT-FM interviewed members of the coalition as well as an official university spokesperson, Janine Sikes. The Gainesville Sun ran a webpoll and discovered that 69.7% of those polled are in favor of spending reserves to meet the budget shortfall, while only 21.4% favor making permanent cuts (8.9% argue that the university should raise funds through benefactors and other means). On June 7-8, UF’s Board of Trustees meets to vote on President Machen’s university budget cut proposal. The SaveCISE community invites you, as a stakeholder in the success of the Computer and Information Science and Engineering (CISE) Department at the University of Florida (UF), to pledge your financial support to a specific future vision of the SaveCISE at UF campaign. One of the options that has gained the most backing from external supporters is for the CISE department to transition into an independent College of Computing at UF with CISE at its core. Here is the link to the Foundation of a Vision for the College of Computing. This transition will need a fund. 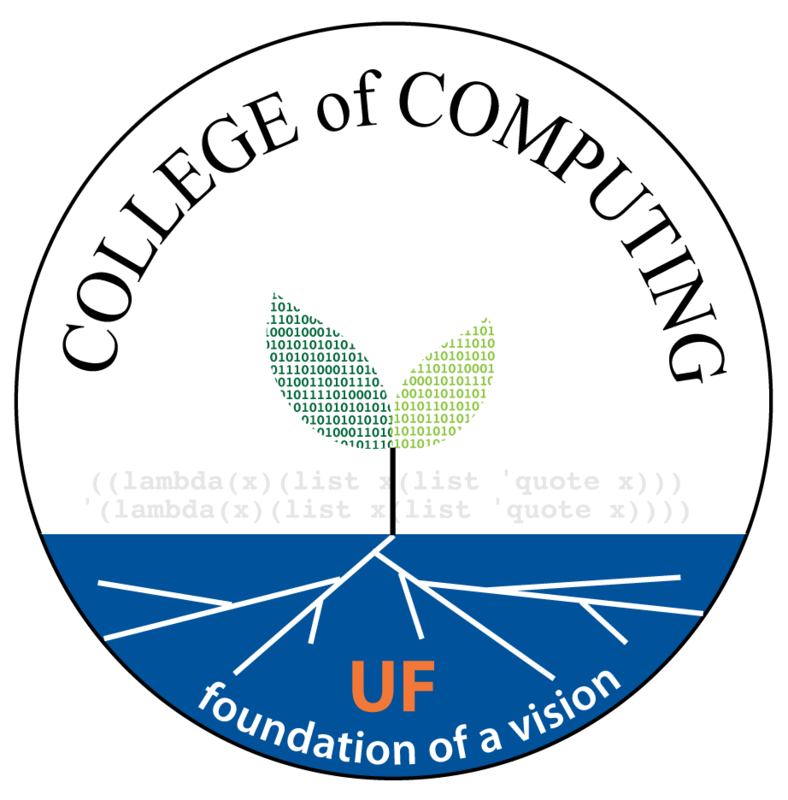 Here we are reaching out to individuals and organizations interested in contributing financially to maintain a nourishing environment for Computer Science at UF through a College of Computing at UF with CISE at its core. WE ARE NOT COLLECTING ANY MONEY AT THIS TIME, ONLY PLEDGES. Through this form, we are assessing the level of support available from external donors who would be willing to contribute financially to our cause, in a time of need. So please pledge to our cause in a manner you can honor if the College of Computing – with CISE at its core – becomes a reality. Here is the list of people who have pledged financial support to the College of Computing and have agreed to have their names publicized (more or less up to date). Here is the pledge form (It contains background and recent events information). On May 11, Dean Cammy Abernathy, along with her administrative colleagues in other colleges, delivered their budget cut proposals to Provost Glover. You can find the 2012-2013 budget cut proposal for each of the University of Florida’s colleges at http://www.ufl.edu/budget-proposals/. The College of Engineering’s “FY 2013 Budget Cuts” document lacks critical details necessary to judge the health and safety of any individual department. Engineering is not alone. Almost every budget cut proposal omits a department-level breakdown, a breakdown for which concerned parents, students, and alumni of affected units are anxiously awaiting. We expect Provost Joe Glover would require his deans to produce publicly available, detailed reports. It is shocking that he accepts such minimalistic levels of detail for budget cut proposals. At the April faculty senate meeting, he acknowledged that these budget cuts will cause serious pain to the programs and offerings at the University of Florida. On April 17, Florida’s Board of Governors declared, “Our Universities will continue to tap their reserves year-round in order to save course offerings, retain faculty and account for enrollment growth, among other critical demands.” President Bernie Machen has elected not to spend the University of Florida’s reserves and to instead interpret the one-time budget shortfall as recurring. 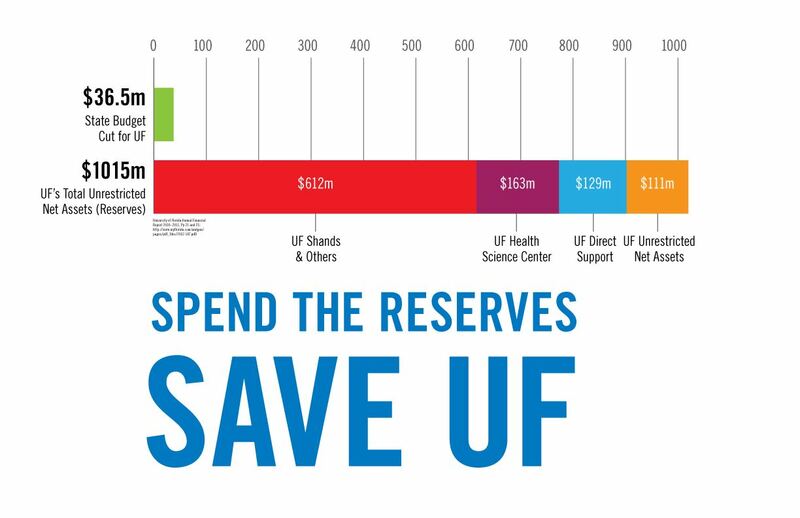 Spending of UF’s reserves is just one strategy to address these state-mandated one-time cuts. Another is by closing some of the 102 open faculty positions. If the university is in such dire financial straits, its administrators should carefully consider adjusting their hiring strategies before making permanent modifications to their colleges’ teaching, research, and services. In Florida, the university with the second-most aggressive hiring strategy in these delicate financial times is FIU. FIU has 2 open positions. Towards a public discourse about Higher Education Performance … starting within UF colleges, on to the national level.